Tasty, Quick and Easy any time of day. Take approx. 6oz (180g) of Crumbly Lancashire Cheese and crumble one on half of a plate. Next take two large free range eggs and break onto the other half of the plate. Pour a little milk onto the cheese and shake a little white pepper onto the egg yolkes. Remove from the oven carefully as the plate will be very hot and will remain so for quite a while. Next butter some nice soft white bread to dip in the cheese and egg and enjoy. 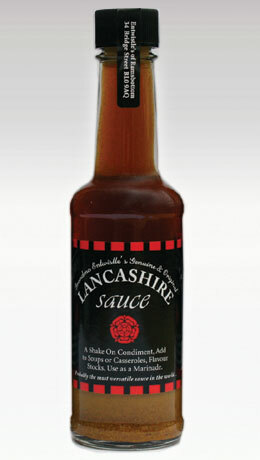 Oh, a splash of Lancashire Sauce will not go amiss! 1. Prepare all the vegetables first, thinly chop the carrots and spring onions, cut the broccoli into small florets and roughly chop the peppers and courgettes. Cut the beef into chunky strips about 2-3cm (1 inch) wide). 2. Heat a small amount of vegetable oil in a wok or frying pan, and when hot fry the beef until lightly brown. 3. Reduce the heat slightly (medium high) then add the carrots, peppers, broccoli and courgettes but not the spring onions. 4. Fry for about 10 minutes until the vegetables start to soften then add the spring onions and enough Lancashire Sauce to lightly cover everything, though add more if you like a stronger taste! 5. Fry for a further 2-3 minutes then serve. Take half a crumpet and slice in half (horizontally) and grill, then grill a slice of black pudding. When cooked place on one half of crumpet and crumble on lancashire cheese. Place other half of crumpet on top, place in oven gas mk4/180 electric for 10minutes and remove, then drizzle with Lancashire Sauce.